SP 4449 - NRHS Convention Specials - the National Railway Historical Society 2011 Convention was held in Tacoma, WA. Southern Pacific 4449 made three special excursions for the event, including a rare mileage trip over Stampede Pass. We cover all three journeys featuring the colorful 4-8-4. 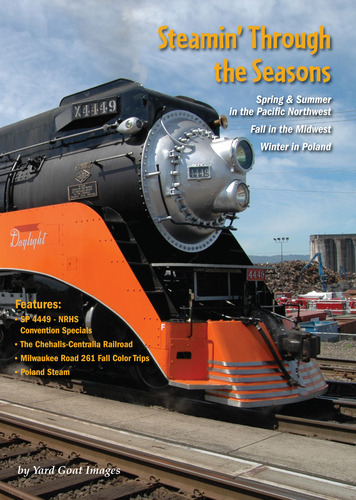 The Chehalis-Centralia Railroad - two days of operation featuring Cowlitz, Chehalis & Cascade number 15, a Baldwin 2-8-2 Mikado. The railroad operates over former Milwaukee Road trackage in western Washington. The NRHS convention trip (including 2 runbys) is featured in our program. Milwaukee Road 261 Fall Color Trips - an annual tradition each Autumn were back-to-back Saturday and Sunday excursions between Minneapolis and La Crescent, MN. Our footage comes from trips over many years presented in the order of a typical weekend operation. Poland Steam - The Wolsztyn Experience allows paying participants to fire and operate steam locomotives in actual scheduled commuter service! Videographer and locomotive engineer Bob Oswald has provided us with footage taken over four of his annual wintertime trips to enjoy active steam in Poland. Multiple tripod mounted HD cameras - Running time approximately 104 minutes - Conveniently organized by chapters - Minimal narration - less talk, more steam action! Steamin' Through The Seasons DVD from Steve Mitchell on Vimeo.